When we created this blog, the main purpose was to study retail history–to document the way shopping centers are now or were in the past, so that people in the future could have some record of them. Unfortunately, we’ve arrived a bit late–hundreds of malls throughout the United States have already been shuttered, and we don’t have pictures to remember all of them. The Newport Mall is one. Of course, this isn’t entirely true: Newport is a thriving coastal tourist city, and courts millions of visitors a year. A stretch of Thames Street a little over a mile long in downtown Newport houses hundreds of stores and restaurants ranging from national chains to local institutions, and it is (and always has been) the true cultural and retail center of this area. Apart from the restrictive geography of the island, this is truly why the mall didn’t make it, especially since downtown Newport was the location of choice for most of the better chains that would’ve made their home in an enclosed mall elsewhere. Still, the allure of the elusive “mall” was probably a big part of why I became so enamored with them, and the fact that my own hometown mall was a “dead mall” likely has something to do with why I became so fascinated with the failure of shopping centers in general. The Newport Mall opened in 1984. From its birth, it was kind of a hack-job; the developers merely enclosed an existing 1950s (or 60s?) vintage shopping center on J.T. Connell Road (Connell Highway to the locals) and added some extra sales space. The center’s original main anchor, WT Grant’s, had folded and was replaced with a JCPenney store (complete with a sit-down restaurant that had a separate mall entrance, a true rarity), and Peerless (one of the many local Providence downtown department store chains) opened a small outlet at the far end of the center. The center of the mall had been anchored by a Food Mart store with a garish lemon-and-lime color scheme that was distinctly of its era. When the mall was enclosed, Food Mart shoppers were forced to somewhat awkwardly wheel carts of groceries through the mall to get to their cars as the supermarket only had access into the mall. It would be replaced by a TJMaxx not long after the mall opened. Consisting of about 300,000 square feet and with room for around 40 stores, the mall was not large but was relatively spread out. The decor was decidedly spartan, consisting of exposed steel beams in the ceiling, a large glass atrium at center court in front of TJMaxx, and relatively standard-issue planters and benches throughout the mall. The Newport Mall was also not located in one of the better parts of the city, surrounded on all sides by big city-style decaying public housing projects, and shoplifting was a terminal problem. During the peak of its life (around 1990 or 1991), the center housed about 30 stores, including Record Town, Waldenbooks, Foot Locker, Afterthoughts, Hallmark, Fashion Bug, and other stores that tended to flock to smaller malls. Unfortunately, throughout the center’s life, nearly every store that did open in the mall was located on the wing between JCPenney and TJMaxx. Bar longtime tenant Fashion Bug, no tenants were ever located between TJMaxx and Peerless, and at its best the mall reached about 60% occupancy. The Peerless store itself would not last long, closing a few short years after the mall opened and being replaced in the early ’90s by a West Marine that shunned the enclosed portion of the mall entirely, opening only into the parking lot. The mall was barely able to survive throughout its entire 14-year existence. The fatal blow came in 1997 when JCPenney announced they were going to close their store at the mall on December 24, 1997. When the Christmas sales were completed, the store went dark and nearly every mall tenant followed shortly thereafter. By the following summer, only Foot Locker, Waldenbooks, TJMaxx, West Marine, and Fashion Bug remained. In fall of 1998, the enclosed portion of the mall (ironically the exact area that was added in the 1984 expansion) was demolished and the plaza was opened back up to the parking lot. The southern end of the mall was also expanded and reconfigured, and an entrance was added to Admiral Kalbfus Road (RI-138). Because the mall began its life as an outdoor shopping center and is now again a strip mall (titled RK Newport Towne Center), anyone who visited the site today would find no trace of the center’s era as an enclosed mall. Anchored by Wal-Mart (who filled the former JCPenney), Super Stop and Shop (who demolished most of the always-empty southern wing), West Marine, Old Navy, a 99 Restaurant, and a slate of smaller tenants, it has been relatively successful in the past half-decade. Interestingly, TJMaxx and Foot Locker are the only two tenants who continue to operate in the exact same place they were located when the center was still enclosed. Because the Newport Mall closed seven years ago and was never well-loved, I don’t have any photographs of the inside or outside. 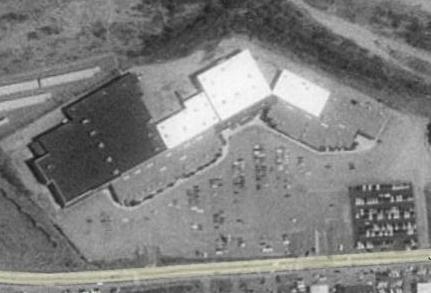 The best I can find is the black and white satellite view below, which shows how the enclosed addition (with the gray roofline with the white border) was grafted onto the existing shopping center (much of which has the black or white roofline). If you happen to know of some, I would greatly appreciate if you would email me and let me know. What–and where–are the other department stores still open in Rhode Island? It was a FoodMart, and was referred to as such. I think it was owned by A&P even then but I don’t recall any A&P branding. There was another A&P store elsewhere in Newport at the time–it’s a Stop & Shop now. Also you’re mistaken about the Nordstrom at Providence Place; it opened with the mall in 1999 (as its first anchor, in fact). It was the second Nordstrom to open in New England. In the past there were more, as you would imagine. The Federated/May merger alone wiped two Filene’s stores off the map (both became Macy’s stores, but the one in the Warwick Mall caused the Macy’s space to go dark). The Rhode Island Mall was once anchored by G. Fox and Sears; the Warwick Mall had Filene’s, Jordan Marsh, JCPenney, and Caldor; and there were standalone Sears stores in both Providence and Middletown that closed some time ago. Lincoln Mall, the state’s other major enclosed shopping mall (now mostly lifestyled) was always anchored by discounters–Caldor and Kmart were there the longest. Also, the vast majority of the old-line New England department stores were wiped out some time ago, but Rhode Island had a few of its own, including Shephard’s, The Outlet, and Peerless. Also Rhode Island was the home of Ann & Hope, the store that practically invented the self-service mass-market discount store (and which Sam Walton admittedly copied for Wal-Mart). There have been 3 other major enclosed shopping malls in RI at one point or another: The Newport Mall (which this post is about), The Wampanoag Mall (one of the first malls in the Providence area, big boxed in the early 1990s–had Woolco-later Marshalls/Rx Place and Cherry & Webb as anchors), and the Wakefield Mall (also profiled on this site; its historical anchors were Woolworth and NHD Hardware). Also, the Garden City Shopping Center in Cranston (which I’ll post about someday) is a large outdoor lifestyle center that originally opened in 1949, and turned out to be rather prescient. It’s still successfully operating today, and one of its anchors is a Cohoes that occupies a space that looks like an old-line department store; I’m not sure if this was something else a long time ago. I forgot to also mention Apex, which I profiled on this site about a year ago. Apex was a Sears-style mid-range mall department store that sold virtually everything, and who had three stores: in Pawtucket and Warwick RI, as well as in the Swansea Mall in Swansea, Mass. (about 15 mi east of Providence). Apex closed their stores in 2001. You forgot to mention the sewage treatment plant across the street, could smell it on ony day the wind blew across the speed trapped road. I lived there as a kid from 1980-1992. I still remember the salon pictures that hung on the outside of JCPennys. Was excited to have the Walden bookstore move in after rennovation so I could read magazines while Mom shopped. What about the strip center where where Zayres and Ames used to be. I also lived near Wakefield. Cool to reminis. I grew up in Newport but lived on Aquidneck Island as a child as well. I remember all to well the poorly thought out “mall” and I look forward to my chance to get ‘back home’ and check out the changes. I wonder if we lived there at the same time. I was born in 1965 and I lived there in the early 70’s until 1980 when I was dragged kicking and screaming by my retiring Navy Dad to Florida where I have remained suffering all these years. I enjoyed your blog and I am sure if I wasn’t already tired from a full day I (being a shopping girl) could give some great commentary on the mall and others but let’s just leave it at this. During the change over to the RK Centre, they moved the Laundromat that initially by West Marine all the way to the other side of the parking lot near Motel 6. West Marine (now an outparcel), Golf Day, Woodworker’s Warehouse, Only A Dollar, Supercuts, Blockbuster, Super Stop & Shop, Harry’s Liquors, Payless Shoe Source, Dress Barn, TJ Maxx, Jo Ann’s, Sally’s Beauty Supply, Waldenbooks, Foot Locker, Wal-Mart, laundromat (outparcel). Shop & Shop’s Gas Station with a Mobil Station seperated by a gate. The current stores left to right are: West Marine (outparcel), Mattress Giant, Expressions, [vacant store], Supercuts, Blockbuster, Super Stop & Shop, Harry’s Liqours, Payless Shoe Source, Dress Barn, TJ Maxx, Old Navy, Sally’s Beauty Supply, Foot Fitness (which took over Waldenbooks and Foot Locker), Walmart, Dunkin’ Donuts (inside Walmart, their former instore resurant Radio Grille was seemlessly changed to a Dunkin’ Donuts a few years ago. Interestingly, there’s a Dunkin’ Donuts across the street from there. Which kinda proves the joke that there’s a Dunkin’ Donuts within walking distance from almost any random point in Rhode Island) Laundromat (outparcel). The gas station, 99 Resturant and Verizon stores are still there. The Mobil has been demolished and replaced with a Gamestop, a mexican resturant and a pita resturant. The gate is now gone. I actually live near the Centre and its actually done better business than the Newport Mall ever did (that parking lot is close to always being filled). TJ Maxx now remains the only original business. The Waldenbooks – despite being somewhat successful was killed along with almost every other bookstore upon the opening of a Barnes & Noble in Middletown (despite it being a few miles away). to respond to Max up on the first comment, you must remember the Benny’s chain of department stores throughout Rhode Island. There are one’s in Newport and Wakefield that are still open as of Mid-2008. I just stumbled upon your blog when trying to figure out what was left out there at the old Newport Mall. I grew up in Portsmouth – and I agree it is sad that there are no photos out there of the Newport Mall when it was still a mall. I never would have thought to take pictures of a boring old dilapidated mall, but it’s pretty amazing how reading this blog brings back memories of hours spent in Record Town, Peerless, Fashion Bug, etc during middle school. I guess next time I’m out there I’ll take a photo of the big ugly Walmart, and maybe that will make me nostalgic in 20 years. My mom went to that shopping center in the 1970’s. @Melissa Dougherty, I worked at the pharmacy with the soda fountain. It was called Liggetts Drug Store. I worked there while in high school.